What determines whether or not something is alive? This chapter argues that this deceivingly simple question is actually the most complicated one. By drawing on examples from contemporary debates and combining these with fieldwork at abandoned places, this chapter problematizes the notions of life and death in political debates on the deindustrialization and depopulation of rural communities in present-day Sweden. Using abandoned places as a springboard for analysis, this chapter argues that dead places are constructed in the intersection of discourse and place. 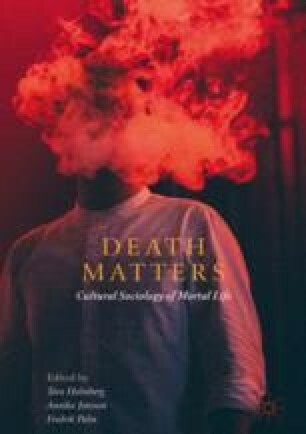 This chapter furthermore outlines how approaching death by looking at the combination of the signifier and that which is signified holds potential for critical investigation of the discourses used to describe a place as dead and dying. Svanström, S. (2015) ‘Urbanisering—Från Land till Stad’, Scb.Se, https://www.scb.se/sv_/Hitta-statistik/Artiklar/Urbanisering%2D%2Dfran-land-till-stad/, data accessed 30 November 2017. Swedish National Heritage Board. (2017) ‘Riksantikvarieämbetet—Fornsök’. RAÄ-Nummer Berg 233, http://kulturarvsdata.se/raa/fmi/html/12000000139787, data accessed 8 September 2017. The Riksdag Administration. (2017) ‘Interpellation 2016/17: 414 Byggande På Jordbruksmark’, http://www.riksdagen.se/sv/webb-tv/video/interpellationsdebatt/byggande-pa-jordbruksmark_H410414, data accessed 4 September 2017. The Riksdag Administration. (2016a) ‘Motion 2016/17:554 Antal Vapen i Vapengarderoben’, http://www.riksdagen.se/sv/dokument-lagar/dokument/motion/tillat-fler-vapen-i-vapengarderoben_H402554, data accessed 4 September 2017. The Riksdag Administration. (2016b) ‘Motion 2016/17:2026 Skåne Som Pilotlän För Gårdsförsäljning’, http://www.riksdagen.se/sv/dokument-lagar/dokument/motion/skane-som-pilotlan-for-gardsforsaljning_H4022026, data accessed 4 September 2017.